It’s cold out. And we were out of propane. But that wasn’t going to stop me from turning two beautiful racks of ribs (scored on sale for an incredible 1.29/pound at Loblaws) into smoky, spicy sticky BBQ style ribs. No siree! With an oven, a bit of ingenuity, a wicked from scratch sauce and a rub containing a liberal amount of chipotle chili powder I managed to make a championship worthy rack of ribs. Thanks to the chipotle they even had a bit of ‘smoke’ flavour. Here’s the recipes you’ll need as well as a bit of ‘how-to’. It all starts with the rub…. Mix all the ingredients thoroughly. Take your ribs and lay them meat side up. Slather the meat side (NOT the bone side) with a bit of oil and sprinkle the dry rub on top. Massage the rub into the meat. If you can, do this several hours before you’re ready to cook the ribs. If you can’t that’s OK too. Set your oven to broil and while it comes to temperature, take a jelly roll pan (or a deep cookie sheet) and place a wire rack on top. Place the meat bone side UP on the rack and place it in the oven. Pour a half inch’s worth of HOT water into the bottom of the pan and let the ribs broil for approximately 5 minutes. Watch the ribs closely, they should be browning but not burning. After five minutes, reduce the heat in the oven to 225 degrees and take the ribs out and flip them over. Cook the ribs meat side up for the next four hours or so. 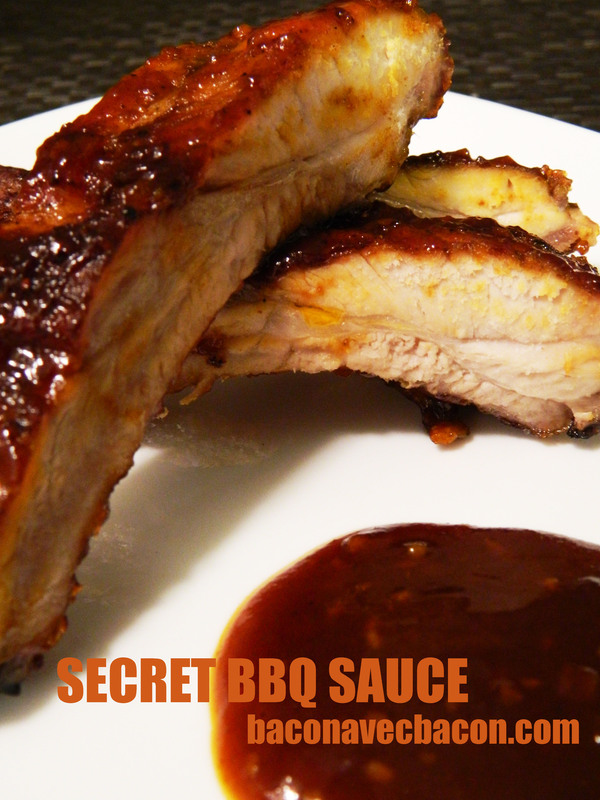 While the ribs are cooking, whip up BBQ sauce from the recipe below. Don’t be lazy and use stuff from a bottle! 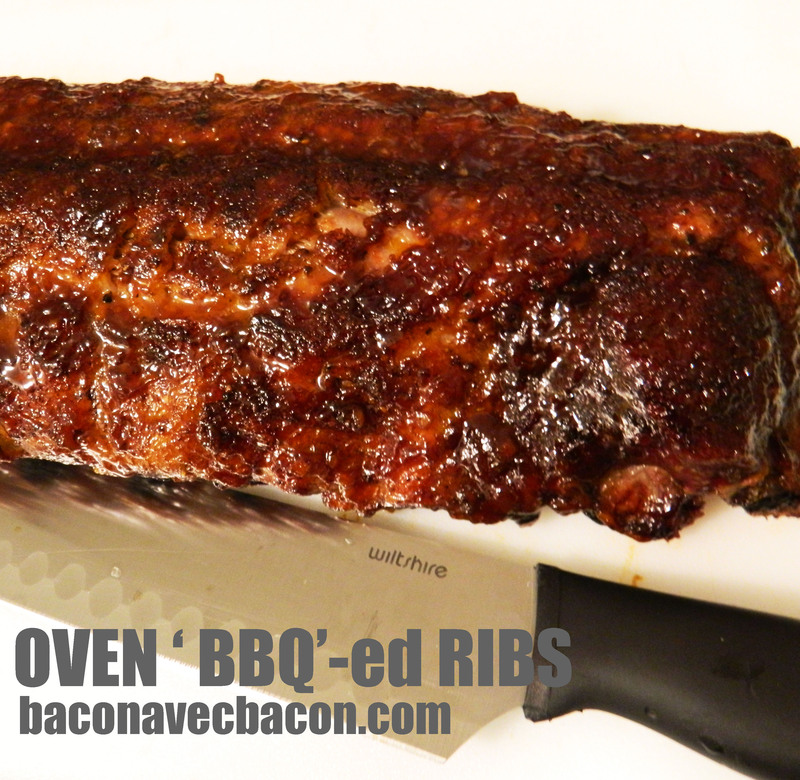 You’ll know the ribs are done when the meat starts to break apart when you bend the rack. At this point, turn the oven back to broil, take the ribs out and flip them bone side up again. Coat the ribs with sauce and pop them under the broiler for 5 minutes. Flip over to the meat side and repeat the saucing and broiling steps. Let the ribs rest for about 10 minutes, cut and serve. In a large saucepan melt the butter and add the onion, salt and pepper and sweat it until soft. Add the chili powder and garlic and cook for another two minutes or until fragrant. Add the liquid ingredients and stir well. Let come to a boil and add the brown sugar. Reduce heat to slow and simmer until the sauce thickly coats the back of a spoon. This sauce keeps for at least a month in the fridge and freezes well. It goes great on all kinds of pork as well as chicken. It’d also make a great topper for meatloaf. Thanks! I don’t buy sauce anymore because it’s SO good!